Would it be possible to burn off Venus' atmosphere using the sun? There have been proposals to change planetary orbits using gravity assists. Could this be used to bring Venus close to the sun, burn off its toxic atmosphere, then move it into the habitable zone for terraforming? If you somehow have the capability to move masses of planetary size, then moving only the atmosphere would be easier than moving the planet itself, being thousands of times less massive. Exactly how this can be accomplished is a concept belonging so far into the future that it is in essence impossible to say anything meaningful about it. Our current capability of sending equipment to Venus is only several tons. Using the sun to heat the gasses of the atmosphere can be accomplished by large mirrors in space. If the gasses have a high enough velocity, they can escape the gravity of Venus. 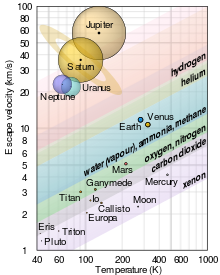 This chart shows how heating the atmosphere can make gasses escape, but the energy requirements are enormous. In order to be able to heat the exosphere, you must focus the mirrors on a tiny part of it, because most of the radiation will just pass through the low density gas. Removing the atmosphere in this way is possible in theory, but how you should be able to do it in practice I have not the foggiest idea of due to the enormous scale of the operation. Making Venus more habitable is possible with other means than relocating it; the lead melting temperatures can for instance be reduced by a large sunshade blocking some of the light from the Sun. That does not get rid of the high pressure at the surface though, but there is life capable of tolerating a pressure of 92 atmospheres, corresponding to a depth of 910 meters in the ocean. Not the answer you're looking for? Browse other questions tagged terraforming or ask your own question. Would terraforming Venus destroy its ionosphere? How would we move Venus or Mars into Earth's orbital zone? Why is Mars favored over Venus? How feasible would it be to move a Kuiper Belt object (a good sized one) into an orbit around Mars? Will thinning the atmosphere of Venus make its surface habitable? Where's the Nitrogen on Venus?